This is our specialty and we are extremely proud to be able to feature this fantastic Laser device at our clinic! 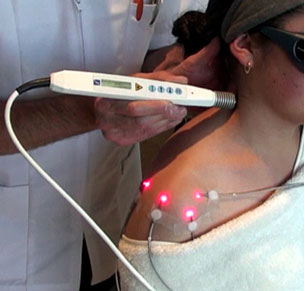 Low Level Laser, also known as Soft Laser or Cold Laser, are being increasingly used successfully in numerous fields of medicine as a natural form of therapy. The radiation produced by the Low Level Laser is applied in such a level that it simply causes a "bio-stimulation" of the body's own natural control circuits, it neither warms nor affects human tissue. This radiation activates all the body's own functions which accelerate the healing process, by stimulating the propagation of phagocytes and macrophages and by stimulating the production of endorphin, simultaneously relieving pain. Latest research confirms, that ultra-low-powered Laser Light stimulates the immune system and thus improves the healing of wounds, cell division and the activity of certain defense molecules. This biological therapy is without side-effects and is based upon the natural processes taking place in our body. We all know that Light means Life - without light there is no life! Treatments are based on the theories and principles of Traditional Chinese Medicine, combining cutting-edge technology. Thousands of years ago bones, stones and other primitive Acupuncture tools were used, nowadays we use high-precision stainless steel needles and more and more Laser-Acupuncture technology! At AcuComfort believe Laser-Acupuncture is the future of Acupuncture. At AcuComfort we offer the latest Cold Laser technology from market leaders in Germany (RJ-LASER), which in our personal and professional opinion is the best Laser-Acupuncture technology available.